As we had still not heard back from the Neurosurgeon (yes I know it is a holiday weekend), I went looking for someone to ask questions of. On the Children's Hospital Boston website I was reading about hydrocephalus and was surprised to find a list of emails at the end with a “If you have any questions, please contact us for more information”. So I emailed them all, and to my surprise I received three replies the same day including from the Chief of Neurosurgery. Based on the pictures on the blog site, I suspect that your son has a suprasellar arachnoid cyst. We usually treat these here with endoscopic surgery - although I must tell you that I would need to see a complete set of the images in order to be certain of the diagnosis and treatment. This is not a five-alarm emergency, but here in the states your child would have been seen the next day. If Kaiden is alert and awake, not vomiting, not holding his head or displaying changes in his ordinary demeanor, the exam could wait for a week or so. I think that you are seeing the NHS in action here - and who knows, maybe there is no emergency. But if it were my child, I would want an exam immediately. Good luck. So, this is particularly pertinent as over the last month Kaiden has gone from a contented settled baby to being very fraught and anxious. He is also holding his head two or three times per day. I will be phoning the Southbank clinic tomorrow to make sure that all of this went into the referral. I think this should be seen and treated sooner. I would do it within a week of first making this diagnosis, as long as the child is not sick. Otherwise, it becomes urgent. I assume he is clinically well at present. This should be able to be treated with a minimally invasive endscopic procedure: opening the cyst and establishing normal CSF circulation. An endoscopic third ventriculostomy may be necessary along with the cyst fenestration. If you met Kaiden today you would not be able to tell him apart from any other 15 month old, except that he is not walking. It is difficult to tell from the 2 images that you provided, but he clearly has a cyst with obstructive hydrocephalus. If this is a suprasellar arachnoid cyst - which is what I suspect based on the images - we would normally get formal visual field testing, endocrine evaluation (the location of the cyst can affect hormonal function in some cases) and try treatment with endoscopic fenestration. It is not usually an emergency, but we would often perform the workup I noted, followed by surgery within 4-6 weeks, barring the symptoms of severe increased intracranial pressure or sudden visual loss. Fortunately, children often fare quite well following treatment and I would expect that your child would have an excellent prognosis. I hope that this helps and I wish you good luck with your child. If you wish to be seen at Children's Hospital Boston, we can help to put you in contact with our international office. I am very grateful to the guys from Children's Hospital Boston that replied to my emails. But I am also angry that I can't get to speak to a Neurosurgeon here in the UK for a month and yet not just one but four American Neurosurgeons take the time to email me. (sigh) This is the system we have and deal with it we will. We were getting more worried by the hour and with four weeks to wait our stress level were through the roof. The Southbank clinic had asked us to have a think about things that were atypical for Kaiden. We have made a list and imparted it to them, but some of these things could be just normal baby developmental changes and it is so difficult to tell which is which. These should all be on the referral with a copy sent to us, but with the holiday weekend I do not think we will see it till Tuesday at the earliest. The scan went fantastically, with Kaiden sleeping in the MRI machine for all but 5 minutes at the end where he waited patiently for it to finish. We were not expecting anything to be wrong as this was just a precautionary scan to make sure that nothing in his head was affecting his gross motor skills. The very next day we got a call from Southbank who said that they has found an Arachnoid Cyst and could we come in the next day to see a Consultant and that Kai would need an operation. We went into the Southbank clinic and spoke to the paediatric consultant who assured us that it was operable but that it was taking up considerable space in Kai’s head. Cerebrospinal fluid is building up as a cyst is blocking the channels it uses to drain. Thankfully they told us that prospects were good and that Kai would expect to make a full recovery before showing us the MRI pictures. The two images I have were taken on my mobile phone as we had to go to one of the back offices to see them. They did not have another computer! 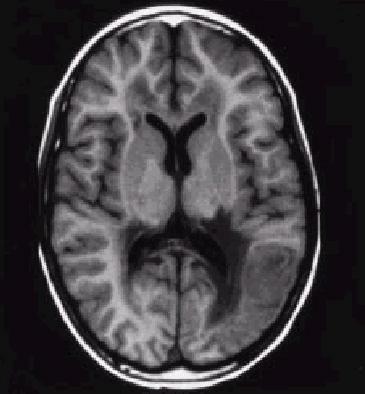 Figure: Normal brain MRI cross section. This normal scan shows the spaces in the middle of the brain that contain and produce the Cerebrospinal fluid. This fluid is needed by the brain but is drained in the middle down the spinal column. Figure: Kai’s cyst blocking the four channels. I do not think that I need to explain the difference between the healthy picture and Kai’s picture. However you can see in this first picture the faint outline of the cyst in the middle that is blocking the four channels from draining. After seeing the scans a Neurosurgeon has decided that he is not acute, but needs an operation to unblock the flow. You can see in the second picture the effect of the build up of fluid. If I was not horrified by the first picture I was seriously horrified by this one. This is not only worse than our worst fears, it is worse than our worst nightmares! Kai is not presenting the symptoms of vomiting or listlessness that would show an immediate problem and as such we will get an appointment to see the Paediatric Neurosurgeon at the Southern General hospital in about 4 weeks. This timescale is based on the Neurosurgeon seeing the scans. After that Kai will need an operation to release the pressure and either remove the cyst completely or put in a permanent shunt (tube from brain to stomach) to bypass the blockage. We have updated his notes for the referral with additional recent information on top of the scan that the consultant things will help improve the timescales, but that is just a guess. All we can do now is wait and see, and be watchful for tell tail signs of listlessness, eye problems and vomiting that would signify a worsening of his condition. Some of you may remember when my son Kaiden was born I posted pictures of him and his sister. Kaiden is now 15 months old and is progressing perfectly in every area except that we had been worried that he was not walking yet. We were only really concerned because his sister was walking at 8 months. Jadie and I were concerned over that and that he had a rather large head (noggin) so we talked to various GP’s and our health visitor who immediately dismissed our concerns every time. That was until about two months ago when we happened to get a GP whose daughter had Hyper Mobility and she recognised the symptoms immediately. We were referred to the Southbank clinic who were lovely and the paediatrician confirmed that he had Hyper Mobility after testing all of his faculties. This just means that his joints are overly mobile and would need a little physiotherapy to help him out. At the end the paediatrician remarked offhand that he has a rather large head and wanted to measure it. Sure enough he was a good margin above the highest percentile mark for his height and weight. The paediatrician showed the measurements to a paediatric consultant who, as a precautionary measure, referred us for an MRI at Yorkhill Children's hospital. Now, Yorkhill has always been fantastic to us, and this was no exception. You know we have NEVER had a correct diagnosis for the kids (with the exception of the above) from a GP and indeed twice have been proscribed incorrect medication that made the kids sicker! We now always go strait to Yorkhill to save them having to fix GP mistakes as well.